Item Description: Naturally chic with a touch of urban industrial flair, the two-tone Esmarina end table beautifully accentuates your clean, contemporary sense of taste. 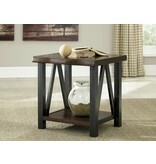 Black metal base with angled braces supports a faux "live" edge tabletop in a rich walnut tone. Lower shelf is just the spot for a pretty storage basket or display space. Series Features: Table tops feature a faux “live” edge top is created with Poplar solids and Acacia wood veneers finished a rich deep Walnut color finish. 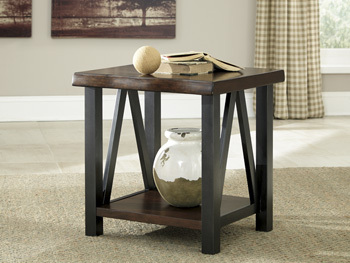 Metal base frames with angled braces add an urban industrial flavor.